Cooking with bitters? Why not. Their flavorful aromatic properties can be harnessed in recipes beyond just cocktails. Angostura's website has recipes for a number of dishes. The Washington Post's Jane Touzalin recently wrote about cooking with bitters as a Free Range on Food chat leftover. (Coincidence? Not really. I was the one that asked about it.) Touzalin perused the recipes on the Angostura site, which mostly are for appetizers, entrees and desserts. She suggested that fruity bitters would be particularly at home in a dessert or vinaigrette. I liked the idea of using bitters in salad dressing, although instead of going the fruity route, I stuck with the spicy classic aromatic Angostura bitters. The Greek yogurt dressing I developed for this chicken salad tastes great without the bitters, but adding them gave the dressing a wonderful spicy dimension. Just like how bitters can pull together ingredients in a cocktail, the bitters in this salad dressing was the final touch that made the dressing really sing. 1. Heat olive oil in a medium frying pan over medium heat. Pat chicken dry with paper towels and add to pan. Season chicken with salt and pepper and cook until browned and cooked through, about 10 minutes, flipping over halfway. Transfer to a plate to cool, then cut into pieces no larger than an inch. 2. Heat a small frying pan over medium-low heat. Add sliced almonds and toast until lightly browned, stirring frequently to prevent burning. Transfer to a plate to cool. 3. 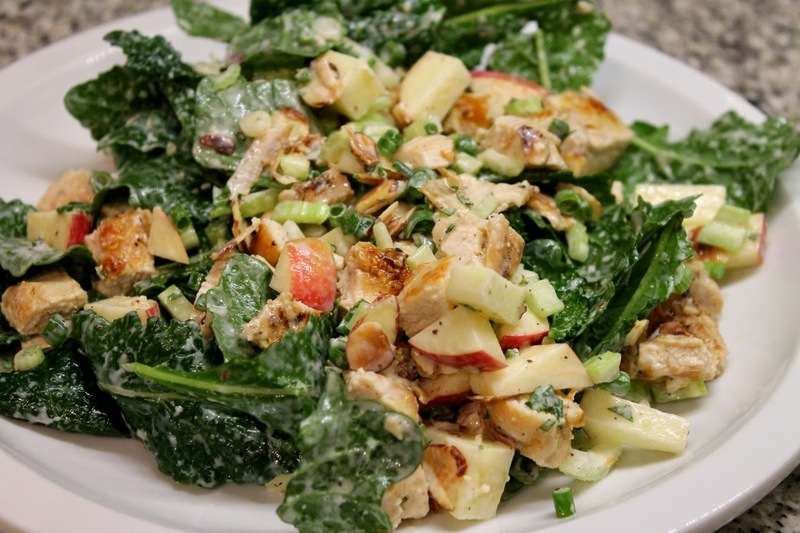 Combine apple, celery, scallions and baby kale in a large bowl. Add chicken and almonds once cooled. 4. Whisk together yogurt, lime juice, honey, mint, salt, pepper and bitters. Pour over salad and toss to combine. Ending a week of bitters-themed posts with a salad recipe -- who would've thunk it? I really like seeing recipes that are specific for vegetarians. Your recipes is so amazing and I love salad! It is one of my favorite cheeses to use in any recipe. This is such a beautiful, healthy salad. I love using Angostura Bitters with chicken like you did. Thank you! I'm glad you enjoyed it. Yeah, the bitters were a good addition. How have you used them with chicken?